Please wait while the page downloads. See recent photos of the Łódź Cemetery here. and with the dedicated cooperation of the officers and men in the IDF 'Witnesses in Uniform' Program. The Israeli army is putting up grave markers or has done so already based on the lists provided within this section, and the YZI has worked on the transliteration of the names and dates of the deceased. This is an ongoing cooperative project. There were no markers on these graves until now. The list of those buried in the Łódź cemetery is a partial one; hopefully more names will be added in the future. You can also search the Master List of burials alphabetically by surname by clicking here. See the Museum's main Łódź page by clicking here. 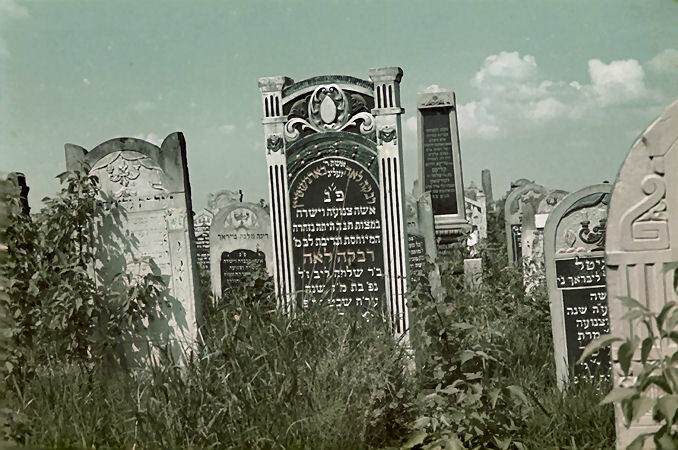 Tombstones in the Lodz ghetto cemetery, 1940-1944. Courtesy of ushmm.org and Robert Abrams.